Summary: Written with a blend of humor and practical wisdom, The Same Sweet Girl’s Guide to Life offers inspiration and solid advice to new graduates that can sustain them through life’s inevitable ups and downs. In this small book readers will find advice that will only grow in meaning throughout the years. It can - and should - be read again and again, by thoughtful people of all ages. King’s true gift is in her ability to present readers with the sort of hard-earned wisdom that will help both young and old find sustenance and renewed meaning in their lives. According to acclaimed author Dorothea Benton Frank, "This little book offers big wisdom delivered with Cassandra King’s signature wit. I can’t imagine a better gift to guide the recent graduate, or for any friend passing through one of life’s transitions." Her first pearl of wisdom: sincerity is an important virtue, and once you learn to fake it, you are well on your way to success! Dare to laugh at yourself. Find kindred spirits and keep them close to you; expand your circle of friends. Know the t rue value of time. She also advises that we try to find words to express love and gratitude but to keep in mind that it is our actions that reveal our feelings more than our words. 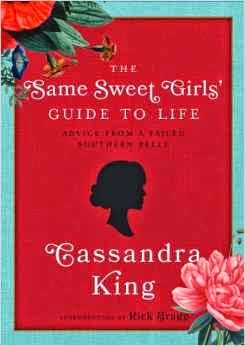 After reading THE SAME SWEET GIRLS' GUIDE TO LIFE: ADVICE FROM A FAILED SOUTHERN BELLE by Cassandra King, I regret not having read THE SAME SWEET GIRLS because I know I'd love it. (Just added another book to my already out-of-control wish list!) While THE SAME SWEET GIRLS' GUIDE TO LIFE (now known as TSSGGTL) isn't a sequel to this novel, it is a companion book. Actually, TSSGGTL was adapted from a lecture Ms. King gave to a graduating class at her alma mater University of Montevallo -- with a few fun extras thrown in! TSSGGTL is a terrific book for women of all ages but especially graduates. Ms. King has put together some fantastic advice to help individuals navigate through life -- and by that I mean the good and the bad. There is also an introduction by Rick Bragg, thoughtful quotations, and some gorgeous photographs and illustrations. I'm totally serious about this being the perfect high school or college graduation gift! I also liked the Author's Afterword because it is geared especially towards book lovers. This section wasn't part of her speech, but her followup advice is to "Become a Lifelong Reader." This little book even has a few pages in the back to log your very favorite books. TSSGGL is a delightful book with some terrific advice. Highly recommended to graduates and women of all ages! Thanks to Saichek Publicity for a review copy of this book. Giveaway alert: I have a copy of THE SAME SWEET GIRLS' GUIDE TO LIFE to share with one lucky reader. To enter, just fill out the form below before May 12th at 11:59 p.m. EST. I will randomly select and notify the winner the following day. This contest is open to those of you with U.S. addresses only. Good luck! You must read The Same Sweet Girls - it's terrific! I've never heard of these books before. I bet my niece would like them.